Eating Up Easter will world premiere (tickets now sold-out) at the 2018 Hawaii International Film Festival tonight at 5:30PM, with additional screenings on November 10, 16 and December 1. Director Sergio Rapu will attend the November 9 and 10 screenings. Purchase tickets for the November 10 screening here. Rapu was featured on Hawai'i Public Radio's 'The Conversation' on Noember 6. Listen to his interview here. Native Rapanui (Easter Island) filmmaker Sergio Mata’u Rapu narrates to his son the modern dilemma of their people who risk losing everything to the globalizing effects of tourism. The film follows four islanders, descendants of the ancient statue builders, who are working to tackle the consequences of their rapidly developing home. 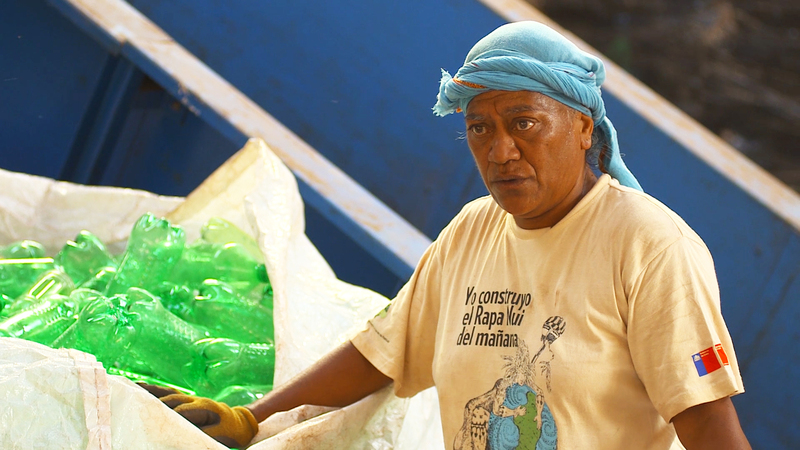 Mama Piru leads recycling efforts to reduce trash, Mahani and Enrique use music to reunite their divided community, and Sergio tries to understand the motivations of his father who embraces the advantages of building new businesses. These stories intertwine to reveal the complexities of development and the contradictions within us all as we are faced with hard choices about our planet’s future. Eating Up Easter is a co-production between Kartemquin Films, Mara Films and Pacific Islanders in Communication (PIC), with funding provided by the Corporation for Public Broadcasting (CPB); edited by Liz Kaar; cinematography by Jeff Saunders; executive produced by Gordon Quinn and Betsy Steinberg (Kartemquin Films), Leanne K. Ferrer (PIC), and Lois Vossen (Independent Lens); produced and written by Elena Rapu; directed and produced by Sergio M. Rapu. Funding provided by Pacific Islanders in Communication (PIC), ITVS, the Princess Grace Foundation, the Corporation for Public Broadcasting (CPB), the Ford Foundation JustFilms grant, and the Sage Fund at Kartemquin Films. Visit the film's official website. Follow the film on Facebook and Twitter.